Radioimmunotherapy (RIT) is a treatment for cancer which combines radiation and immune therapy using monoclonal antibodies. RIT uses a radioactive material attached to specially designed antibodies to locate cancer within the body. Antibodies are defense proteins which are naturally produced by the body's immune system in order to fight infections caused by bacteria and other foreign pathogens. The antibodies used in RIT are monoclonal antibodies (MAbs) which are developed in the laboratory in order to recognise marker molecules on the surface of tumor cells. These antibodies are then modified to bind the radioactive metal Yttrium-90, which delivers high levels of local radiation to the tumour and subsequently destroys it. Therefore no single parameter is a good indicator of how effective the RIT has been. Instead, several factors have to be simulataneously considered in order to get a more accurate characterisation of the biological effect. The aim of this study by Flynn et al. was to develop a mathematical model that would relate the absorbed dose and its pattern of delivery to tumour response by incorporating information on each of the six influencing factors (see the figure below). The mathemtical model was then used to optimise therapeutic efficacy in mice by matching the antibody and radionuclide characteristics while ensuring recoverable marrow toxicity. 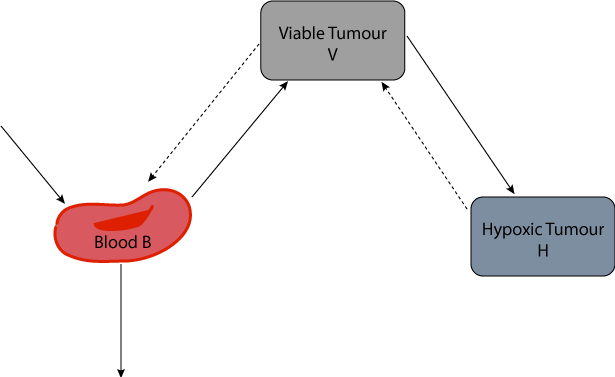 A schematic diagram of the three compartment model representing blood (B), viable tumour (V), and hypoxic tumour (H). Flow between compartments is governed by flow rate constants. Derived from workspace Flynn, Green, Pedley, Boxer, Dearling, Watson, Boden, Begent, 2002 at changeset f6e356c29a7d.